Tag Archives for " dave kerpen "
Ask most any business owner and they will tell you that one of the hardest parts of growing a business is managing people. Entrepreneurs are typically visionaries and that trait doesn’t always come with natural leadership skills. The fact is that there are few simple habits that will allow you get more of what you want if you work to embrace them. Now, I’m not talking about manipulation, I’m simply talking about creating greater influence by paying attention to how others think, feel and act and adopting a better way of interacting with all of the folks you come into contact with day to day. Everyone need work in this area – myself very much included. My guest for this week’s episode of the Duct Tape Marketing Podcast is Dave Kerpen, co-founder and chairman of Likeable Media, an award-winning social media and word-of-mouth marketing firm. He is also the founder and CEO of Likeable Local, a great social media management tool. 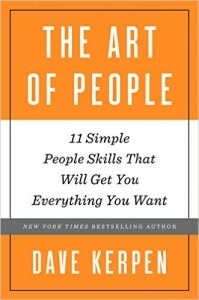 We discuss his new book The Art of People: 11 Simple People Skills That Will Get You Everything You Want, people skills, and how entrepreneurs can manage their employees better. If you ever get the chance to meet Kerpen you’ll immediately learn why he is so qualified to write this book – Dave is a people person. The Art of People is structured in a way that makes it very easy to read and digest. Chapters are short and to the point and each ends with action steps. How can someone improve upon his or her people skills? What are the advantages of having an advisory board? How to become a better manager and a better leader of the people you work with. How famous business leaders have overcome poor leadership skills. Why the “Golden Rule” really doesn’t apply to leadership today. Dave Kerpen had the foresight a few years ago to lock up the term Likeable. It’s the name of his business, Likeable Media, the name of his mega selling book Likeable Social Media and it’s been applied to his latest work, Likeable Business. But as Kerpen quickly points out, being likeable in business isn’t about social media or even the marketing department, it’s about a profitable way of doing business. Applied to the business globally it extends to behaviors as much as tactics. It applies to how you listen and respond, how you tell stories, how authentic and transparent every aspect of your business is, how you change and adapt, how surprise and delight, how you partner, how you do business in general and even how you say thank you. In many ways we no longer have a choice about being transparent and authentic – we either are or we aren’t and it’s pretty much on view for the world to see, consider, write about and share. In this episode of the Duct Tape Marketing Podcast, Kerpen talks about businesses that are getting this right and how any business can naturally become more likeable. It’s time to understand that this isn’t something nice to consider when you’ve got a moment or two, this is a highly practical way of doing business that is fast becoming an expectation in every market segment. I’m taking some vacation time this week and I’m actually going to stand waist deep in the Columbia River in Oregon and cast for Trout. (Don’t worry I won’t hurt any I’m strictly a catch and release kind of guy.) While I am away, I have a great lineup of guest bloggers filling my shoes. This post is brought to you from Dave Kerpen. Dave Kerpen is the CEO of Likeable, a social media agency that has worked with more than 200 leading brands, including Verizon and Neutrogena. He is author of The New York Times best seller Likeable Social Media. Dave recently launched Likeable Community College and Likeable Local. Over 900 million people in the world are on Facebook, including over 180 million Americans, or 1 in 2 adults. Twitter recently surpassed 300 million accounts. Small business owners are trying to take advantage of these trends, but few are fully reaping the rewards. 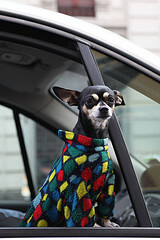 For most business owners, the temptation is to use social networks to promote themselves and broadcast their messages. But if you stop thinking like a marketer and start thinking like a customer, you’ll understand that the secret to social media is being human – being the sort of person at a cocktail party who listens attentively, tells great stories, shows interest in others, and is authentic and honest. The secret is to simply be likeable. Listen first. Before your first tweet, search Twitter for people talking about your business and your competitors. Search using words that your prospective customers would say as well. For example, if you’re an accountant, use Twitter to search for people tweeting the words “need an accountant” in your town. You’ll be surprised how many people are already looking for you. Ask questions. Wondering why nobody’s responding to your posts on Facebook? It’s probably because you’re not asking questions. Social media is about engagement and having a conversation, not about self-promotion. If a pizza place posts on Facebook, “Come on by, 2 pizzas for just $12,” nobody will comment, and nobody will show up. If that same pizza place posts, “What’s your favorite topping?” people will comment online– and then be more likely to show up. Share pictures and videos. People love photos. The biggest reason Facebook has gone from 0 to 900 million users in 7 years is photos. Photos and videos tell stories about you in ways that text alone cannot. You don’t need a production budget, either. Use your smartphone to take pictures and short videos of customers, staff, and cool things at your business, and then upload them directly to Facebook and Twitter. A picture really is worth a thousand words – and a video is worth a thousand pictures. Spend at least 30 minutes a day on social media. If you bought a newspaper ad or radio ad, you wouldn’t spend 5 minutes on it or relegate it to interns. Plus, there’s a lot to learn, and every week, new tools and opportunities across social networks emerge. Spend real time each day reading and learning, listening and responding, and truly joining the conversation. The more time and effort you put in to social media, the more benefits your business will receive. Above all else, follow the golden rule: Would you yourself click the “Like” button, the Follow button, or Retweet button if you saw your business on Facebook and Twitter? Would you want to be friends with your business at a cocktail party? 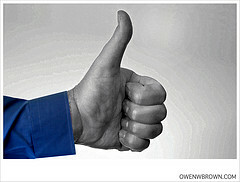 Just how likeable is your business? 16	Is Facebook Still Likeable?